Flossie's Blend is a premium Arabica coffee consisting of the superior Hacienda La Minita Tarrazu, Daterra Estate's Espresso Reserve and a nicely rested Papua New Guinea. Gentle effervescent flavour attributes of orange and clove are rounded with that of apple, and ALL is coupled with Caffe Fresco SCR's generous touch of chocolate aromas to fill out your cup. 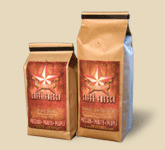 Flossie's Blend is suitable for all brew methods including espresso.